Jaska Raatikainen (born July 18, 1979) is a Finnish musician, the drummer and co-founder of the band Children of Bodom. 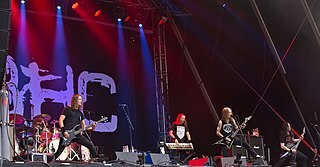 Children of Bodom is a Finnish extreme metal band from Espoo. Formed in 1993 as Inearthed, the group consists of Alexi Laiho, Janne Wirman (keyboards), Henkka T. Blacksmith (bass), Jaska Raatikainen (drums) and Daniel Freyberg. They have released ten studio albums, two live albums, two EPs, two compilation albums and one DVD. His first instrument was the piano, and during most of his childhood also played the French horn in a big band – a fact which later led him to be introduced to Alexander Kuoppala. It was only at the age of 12 that he began playing drums; he had his first double bass pedals before he owned a drum kit. He was inspired by musicians such as Scott Travis (from Judas Priest) and Mikkey Dee (from Motörhead). Alexander Kuoppala is a Finnish musician. He was the rhythm guitarist for the Finnish heavy metal band Children of Bodom from 1995 to 2003. He played on their albums Something Wild, Hatebreeder, Follow the Reaper, and Hate Crew Deathroll. He also plays on the Timo Rautiainen album Sarvivuori. 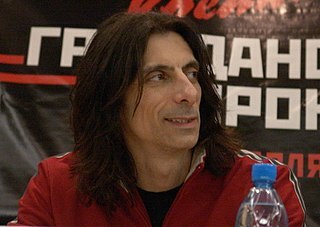 Mark Scott Travis is an American rock musician, best known as the drummer for the English heavy metal band Judas Priest, the Irish rock band Thin Lizzy, and the American heavy metal band Racer X. When Raatikainen met Alexi Laiho at school in the year of 1993, they realised that they had similar ideas and musical taste. Thus, they began playing together and idealizing their band Inearthed which would one day become Children of Bodom. The band released their first demo, Ubiquitous Absence of Remission, which he contributed some keyboards. Jaska played a vital role in the formation of the band, since he was the one who brought both Alexander Kuoppala and Janne Wirman to their line-up. Jaska also provided backing vocals on the songs "Warheart", "Black Widow", and "Children of Bodom" from his band's album, Hatebreeder. Alexi "Wildchild" Laiho is a Finnish guitarist, composer, and vocalist. He is best known as the lead guitarist, lead vocalist and founding member of the melodic death metal band Children of Bodom, and is also the guitarist for Sinergy, The Local Band and Kylähullut. He has previously played with Thy Serpent and Impaled Nazarene on occasion, as well as Warmen and Hypocrisy. Janne Viljami "Warman" Wirman is a Finnish musician; he is the keyboardist for the bands Children of Bodom and Warmen. 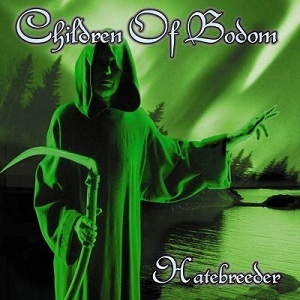 Hatebreeder is the second studio album by Finnish metal band Children of Bodom. The “Deluxe Edition” was released in 2005 with bonus material. Hatebreeder was also re-released in 2008. He has also helped quite a few bands when they needed a competent drummer. During Sinergy's 2000 European tour, he replaced Tommi Lillman, who had injured his leg. The problem, however, was that this happened three days before the start of the tour, which meant that Raatikainen had to quickly learn how to play ten of Sinergy's songs. Despite the high degree of difficulty, he managed to perform very well, and fans of both bands enjoyed seeing both Raatikainen and Laiho on stage together with Sinergy. On the Suicide by My Side album's booklet, the band wrote a dedicatory to Raatikainen for, on to their own words, "saving [their] tour". Sinergy was a Finnish metal band started in 1997 by American musician Kimberly Goss. The idea for a "balls-out female-fronted metal band" was first formed when Kimberly Goss of Dimmu Borgir met Jesper Strömblad of In Flames whilst on tour in 1997. Suicide By My Side is the third and final album by the power metal band Sinergy, released in 2002. It shows a substantial progress in their musical style; singer Kimberly Goss performs in a sharper, more aggressive vocal style, and guitarists Alexi Laiho and Roope Latvala perform more technical solos. Goss has noted that while the title are to an extent autobiographical, unlike she states in the music video, she has never attempted suicide. Raatikainen has also played in Virtuocity and Evemaster albums, but since those are both studio bands, he does not have to worry greatly about Children of Bodom's tour schedule, which already has to be calculated ahead to some extent, due to Laiho's previously active participation in Sinergy. On the 2002 tribute to Chuck Schuldiner – mastermind of one of the most notable death metal bands of all time, Death – Raatikainen, who is a fan of the band, played a couple of cover songs with Norther. A year later, Raatikainen formed a side project with Norther's guitarist Kristian Ranta entitled Gashouse Garden, which has not yet been signed to any recording label. Charles Michael "Chuck" Schuldiner was an American singer, songwriter, and guitarist. He founded the band Death in 1983 and was their lead vocalist until his death in 2001. His obituary in the January 5, 2002 issue of UK's Kerrang! magazine said that "Chuck Schuldiner was one of the most significant figures in the history of metal." Schuldiner was ranked No. 10 in Joel McIver's book The 100 Greatest Metal Guitarists in 2009 and No. 20 in March 2004 Guitar World's "The 100 Greatest Metal Guitarists". Schuldiner founded the publishing company Mutilation Music in 1987, affiliated with performance rights organization BMI. Death was an American death metal band from Orlando, Florida, founded in 1983 by guitarist and vocalist Chuck Schuldiner. Death is considered to be among the most influential bands in heavy metal and a pioneering force in the extreme metal subgenre of death metal. Their debut album, Scream Bloody Gore, has been widely regarded as the first death metal record. Up to the recording of the album Hatebreeder, Raatikainen was endorsed by Sonor drums and by Sabian cymbals. He eventually lost the deal with Sonor and for some time played with different drumsets, until settling with Pearl drums in 2003. His drumsticks are custom Millennium II sticks from Pro Mark with his name engraved on them. Raatikainen has had some side projects, some of them unrelated to music. In the year of 2000 he was asked by the director of a popular Finnish soap opera (Siamin Tyttö) to play a special part on it. He played a character named Rauli for three episodes, until the character's death. He did have the chance to show some of his drumwork before that happened, though. According to Raatikainen, he had always dreamed of acting, but does not plan to take his career further. Raatikainen has two brothers; Jussi, who plays for numerous professional Finnish metal bands, as well as Julius, who plays for melodic death metal band Kauna. Raatikainen is a quiet and reserved person who spends a lot of time by himself. Most of the time, he stays in single rooms in hotels and generally picks the beds on upper corners while travelling on tour buses. Interviews with him are rare, and despite being one of the founding members, he lets Laiho and Henkka Seppälä do most of the talking. In early 2010, Raatikainen became the father of a baby girl. 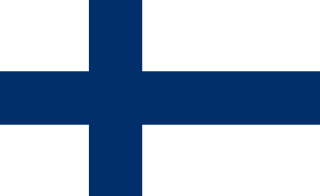 Although his last name is Raatikainen, he is not related to another Finnish guitarist, Sami Raatikainen.
" Was It Worth It?" Something Wild is the debut full-length album by Finnish melodic death metal band Children of Bodom, released in 1997 in Finland, and in 1998 worldwide.. Upon release, the album was met with universal acclaim by music critics. 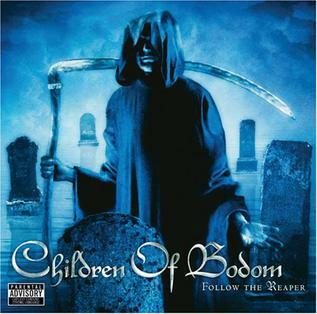 Follow the Reaper is the third studio album by Finnish melodic death metal band Children of Bodom, released in Finland in October 2000 by Spinefarm Records and in February 2001 internationally by Nuclear Blast Records. Hate Crew Deathroll is the fourth album by the Finnish melodic death metal band Children of Bodom, released in 2003 under the Century Media label. The album is the final one to feature guitarist Alexander Kuoppala. It was successful both in Europe and the USA, which is demonstrated by the appearance of the "Needled 24/7" music video on MTV2's Headbangers Ball. "Needled 24/7" also featured on the heavy metal documentary Metal: A Headbanger's Journey and the 2012 horror comedy video game Lollipop Chainsaw. Roope Juhani Latvala is a Finnish guitarist, best known as the former rhythm guitarist for the band Children of Bodom and co-lead guitarist of Sinergy. He was also one of the founding members of Stone, which was one of the first notable bands in the history of Finnish heavy metal. Are You Dead Yet? 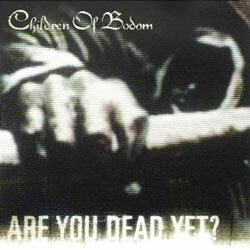 is the fifth album by Finnish melodic death metal band Children of Bodom. It was released in Finland on September 14, 2005 and internationally on October 25, 2005 under the Century Media label. It is the first Children of Bodom album to feature guitarist Roope Latvala, due to the departure of Alexander Kuoppala. In this album, the band used the drop C tuning, whereas they usually used D standard. The power metal influences previously prominent are also greatly reduced in this album, resulting in a more simplistic performance and slower tempos. The keyboards also were dropped lower in the mix, with the guitars maintaining musical dominance. Meinl Percussion is a manufacturer of percussion instruments based in Gutenstetten, Germany. The company is one of the "big four" manufacturers of cymbals, along with Zildjian, Sabian and Paiste. Jürgen "Ventor" Reil is the long-time drummer for German thrash metal band Kreator. He is one of the only two original members left in the band, although he has left "at least twice" due to personal differences. Derek Roddy is an American drummer and snake breeder, originally from Deerfield Beach, Florida. His ability to record entire drum tracks in one or two takes earned him the nickname "One Take". Derek M. Kerswill is an American musician best known for his drumming in the bands Unearth, Seemless, Kingdom of Sorrow, and multiple fill-ins/studio projects. Skeletons in the Closet is the first compilation cover album by the Finnish melodic death metal band Children of Bodom, released on September 22, 2009 through Spinefarm Records. The album only contains four unreleased covers for the songs "Hell Is for Children", "Antisocial", "War Inside My Head", and "Waiting", but the previously released songs are remixed and new details can be heard. The Japanese edition is pressed in SHM-CD format. Daniel "Dan" Wilding is an English drummer from Chichester, England. The Ugly World Tour 2011 was a concert tour by Children of Bodom in support of their seventh studio album, Relentless Reckless Forever. The name of the tour comes from a song from the new album called Ugly. The Blooddrunk Tour was a concert tour by the band Children of Bodom which ran from 12 April 2008 to 24 October 2009. Benny Greb is a prolific German drummer and clinician. He started playing the drums at age six and began taking lessons at age twelve. He plays a large variety of music and can be seen playing rock with Stoppok and The Ron Spielman Trio, jazz with The Benny Greb Brass Band and Sabri Tulug Tirpan, funk with Jerobeam, fusion with the NDR Big Band on their Frank Zappa Project, with 3erGezimmeR and Wayne Krantz, and acoustic punk with Strom & Wasser. He has also performed at the Modern Drummer Festival 2010 and at many clinics and drum festivals around the world. Greb is endorsed by Sonor Drums and has his signature snare, Remo Drum Heads, Vic Firth, and by Meinl Percussion. He developed with Meinl a signature line of Byzance Vintage Series cymbals including the "Sand Ride" and "Sand Hats," both known for their sandblasted finishes. In 2012, Meinl introduced new "Sand Crash" and "Sand Crash/Ride" cymbals to the Byzance Vintage lineup. Furthermore, Benny has a set of trash hats that he uses on the right side of his kit. Holiday at Lake Bodom is a compilation album by the Finnish melodic death metal band Children of Bodom, featuring one song from Something Wild, three from Hatebreeder, three from Follow the Reaper, four from Hate Crew Deathroll, four from Are You Dead Yet?, one from Blooddrunk, two from Relentless Reckless Forever, and two previously unreleased cover songs. The DVD portion of the package includes "candid touring and backstage footage from around the world”, plus the music video for "Shovel Knockout". The album was released on May 22, 2012. Matthew Wolfgang "Matt" Garstka is an American drummer, best known for his work with instrumental progressive metal band Animals as Leaders.